Will the eBay Password Breach Finally Scare Off Investors? eBay's breach raised an issue of harm and confusion, but overall, investors may buy the dip, given its strong credit rating and outlook. NEW YORK (TheStreet) -- eBay (EBAY - Get Report) cyber security attacks don't just happen at year-end, as they did with Target (TGT and Adobe (ADBE. This spring eBay was the latest and may even be the largest victim of the year. What does this mean for public companies that are cyber attacked? If you look at investor and analysts' reaction to eBay in a vacuum, not much. The world's largest online auction site is still backed with strong believers in the company. 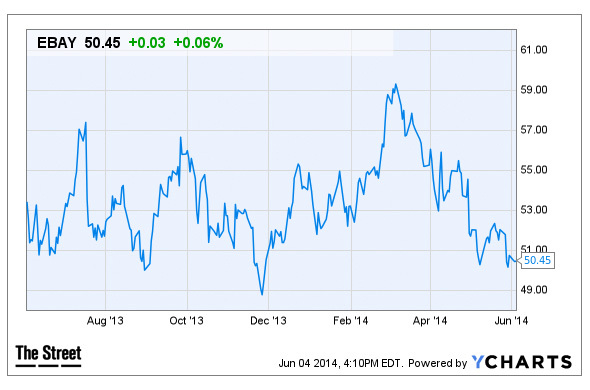 Some investors are viewing the recent decline of eBay shares as an opportunity to buy. Its resilient margins "despite customer experience" and its strength in mobile commerce were cited by MorningStar days before the breach. It is currently a 4-star stock with and A+ MorningStar credit rating. MSN's StockScouter rates eBay a 7, with 10 being the best possible rating. Analysts there expect the stock to outperform the market for the remainder of the year. Its efforts to revive eBay marketplaces business, growth through PayPal and strong leadership team are widely cited positives. The stock finished trading with a 0.47% drop Tuesday, at $50.49. The stock closed up 3 cents Wednesday, at $50.45. Its 52-week range is between $48.06 and $59.70. Its 3-month average trading volume is 11.5 million. About 6.6 million shares traded Wednesday. Cybercrimes are a growing epidemic. According to IBM's Platform Security Report, annual losses for U.S. corporations alone from cybercrime and IP theft is estimated to be $338 billion. For every detected security breach there are 100 that go undetected. eBay was the victim of the password-data breach and cyber attack on May 21. The company notified 145 million of its active users to change their passwords the following day. Cyber attackers compromised a small number of employee log-in credentials, allowing unauthorized access to eBay's corporate network, the company said. eBay's password breach just hasn't caused much of a market calamity. The day the company announced the cyber attack, eBay's stock finished trading virtually unchanged, dropping all of 8 cents to $51.88. Customer passwords must meet above-average decryption standards. Passwords are encrypted by using a hashing technique, which converts text into irreversible jumbled code. These codes are also salted with random digits. If even the strongest passwords can't save consumers from being hacked, then what difference does changing the password really make? Customers and companies can never be immune from phishing and hacking. In my opinion, we are all basically handing passwords over to hackers, so it doesn't matter how complex the password is. "An organization must constantly be scanning and monitoring for potential vulnerabilities." "Internal access to data should follow the principle of least privilege, there should be appropriate company policies regarding the use of the information systems and applicable employees should attend privacy and security training." eBay was not the only company hit by data breaches. In 2013, Target, Facebook (FB, and Adobe were amongst over 25 companies also under fire. Roxanne Austin, interim chairwoman of Target, will be asking shareholders to let her and six other directors keep their seats when voting at next week's June 11 annual meeting in Texas. There was a recommendation that shareholders fire the chairwoman and directors for inadequate oversight tied to the data breach. The hacking attack clearly left everyone except Wall Street worried. Investors can now get real and focus in on looking at areas such as the potential PayPal spin-off, or the IPO that billionaire Carl Icahn once suggested. The tycoon and golf pro Phil Mickelson are currently being probed for insider trading by the FBI and the SEC. eBay recently ramped up its buyback program which should begin to prove positive for the stock. The spin-off of PayPal could offer a bullish catalyst, adding more value for investors.